This is a great idea! Imagine how much fun it will be for your smartest friend to receive The Baffler. By entering this information, you’ll be creating a new account for the giftee. If you don’t already have a subscription for yourself, click here. Print + Digital: One year of The Baffler in print and on your digital device ( ink-and-paper issues, plus files for your Kindle or e-reader; $50.00 for Canada; $70.00 for international subscriptions). Digital: One year of The Baffler on your digital device ( files for your Kindle or e-reader). 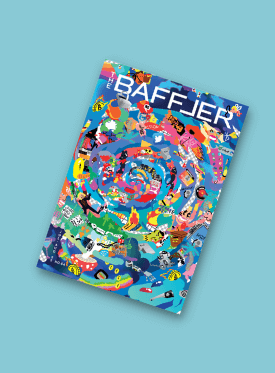 ** The Baffler will automatically renew your subscription. You will receive a reminder notice before the start of each renewal period. You may cancel your subscription at any time.